Champagne diamonds are very, very beautiful. With a great deal of light refraction, sparkle and an exquisite lustre, these amazing diamonds should not be overlooked if you are considering a fancy coloured diamond for a ring. Champagne diamonds are quite a low cost when you compare them to the price of white diamonds. This gives lovers of this diamond colour the opportunity to have a larger diamond than they otherwise would be able to. Having a champagne diamond can mean you have greater flexibility in the ring design. This is because not as much of your budget is used in the central diamond selection. 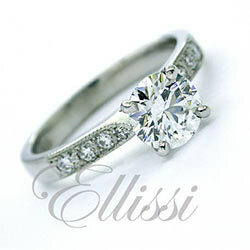 You can, if you want, incorporate more small white diamonds into the ring design. White diamonds contrast beautifully with the warm tones of the champagne diamond, helping to bring out the richness of colour of the central diamond. A really great combination! The lightest shades of Champagne diamonds will display the colour spectrum beautifully. These diamonds have a variety of shades, from the very pale tones of the C1 levels, through to the C3-4 grades. The colour becomes darker the higher up the scale you go. Champagne diamonds are a very underutilized gemstone. They are suitable for a range of jewellery from engagement rings and dress rings to pendants and earrings. It is definitely worth having a look at these stunning diamonds if you want a real point of difference. If you want to have a ring that is not the usual retail store type design, champagne diamonds are a great choice. This is especially the case when you consider the beauty of the diamond, and the fact that they are a lower cost than the same size in traditional white diamonds. For those that really want a ring that is unique, these diamonds are a win win! “Sparkling” Champagne diamond antique cluster ring. “Bliss” Champagne colour diamond cluster ring. “Aria” Champagne diamond dress ring.